Featuring The Caves of Androzani, The Talons of Weng Chiang and the 1996 Television Movie. 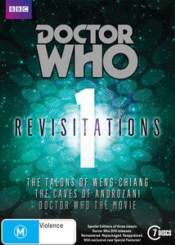 Revisitations 1 is a 7 disc collection containing updated versions of The Talons of Weng-Chiang, The Caves of Androzani and the 1996 TV Movie starring Paul McGann. Tom Baker stars as the Fourth Doctor in The Talons of Weng-Chiang where he becomes involved in a mystery with Chinese assassins and a mad scientist. Peter Davison stars as the Fifth Doctor in The Caves of Androzani as he searches for the elixir of life. In the TV Movie, the Eighth Doctor, Paul McGann, wanders San Francisco on New Year�s Eve 1999, where he is critically wounded in a gangland gun battle. Later, in the morgue, the Doctor wakes up a new man. But he is not the only one � the Master has also found himself a new body. As the clock counts down to the start of the new millennium, can the Doctor stop his oldest enemy destroying all life on Earth?